With our very warm March, we spent more time outdoors than usual, and one Sunday we decided to take a hike to check out a cave I had the coordinates to. 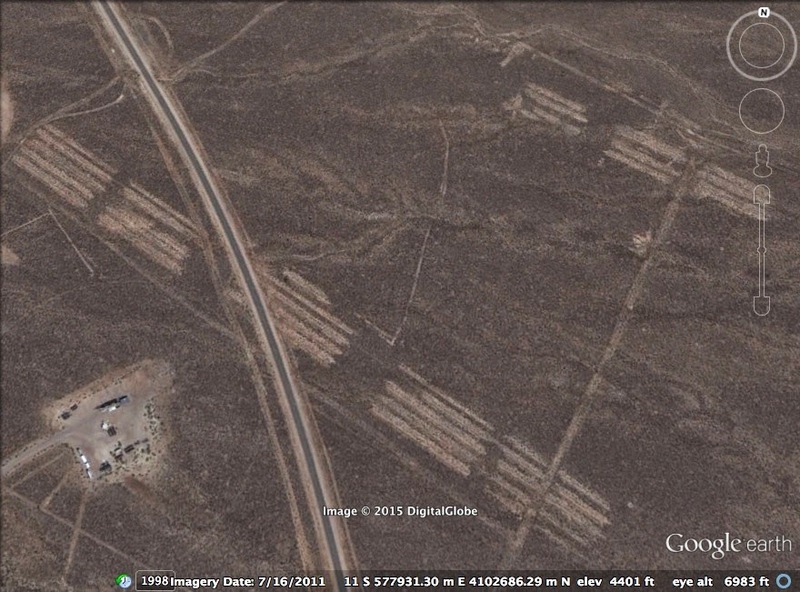 I didn't have much more information than the coordinates, so we didn't know what to expect. We packed up and enjoyed the hike, seeing a few splashes of color as wildflowers like Indian paintbrush (above) and milkvetch (below) bloomed. This juniper on the top of a cliff looked like a bonsai tree. It took us about 45 minutes to find the cave. I rigged a rope to check out the entrance and found this western fence lizard hanging out on a midden part way down. I had managed to forget a descent device (never mind that I have seven), so I rappelled on a munter. (It's great to know different techniques--if you'd like to learn more, check out this upcoming cave rescue training.) Then I climbed out and lowered my husband and Desert Boy. Desert Girl didn't want to be lowered, and I wanted to move the rope to an easier spot to get out of the cave, so we went in from this side, where we could see the dark mouth of the cave beckoning. We only found one historic signature in the cave, Cliff Bellander on June 25, 1955. The entrance descended steeply over boulders and cobbles. Before long we saw old, weathered formations. The floor was primarily a packrat midden. The cave kept descending fast, and I was glad I had my 20 feet of webbing to help belay the kids down the steep sections. Most of the cave was very dry, but we did find this wet formation with very pretty decorations. The cave wasn't large, but it was certainly larger than we were expecting. And more beautiful too. It's such a treat when things turn out that way! Then it was time to head out. Desert Boy scrambled out with the help of the rope before I even finished taking photos. Desert Girl tried, but needs a little more strength. She was happy to be hauled out. I wanted to get a family photo, but those seem to be hard to get when we all look happy. We knew the truck wasn't far, and the kids wanted to get to the snacks. So they took off. I was impressed with how Desert Girl ran through the bushes, jumping over small obstacles. I was a lot slower, pausing to take photos, like this bitterbrush seed. It was a fun adventure and a good day. On one beautiful day when I was feeling restless and the kids were bickering over electronics, I told them we had to go on an adventure walk. They grumbled. But I stood my ground. We'd walk down to the shop and get a ride back with Dad. But we wouldn't follow the road, we had to go a more interesting way. 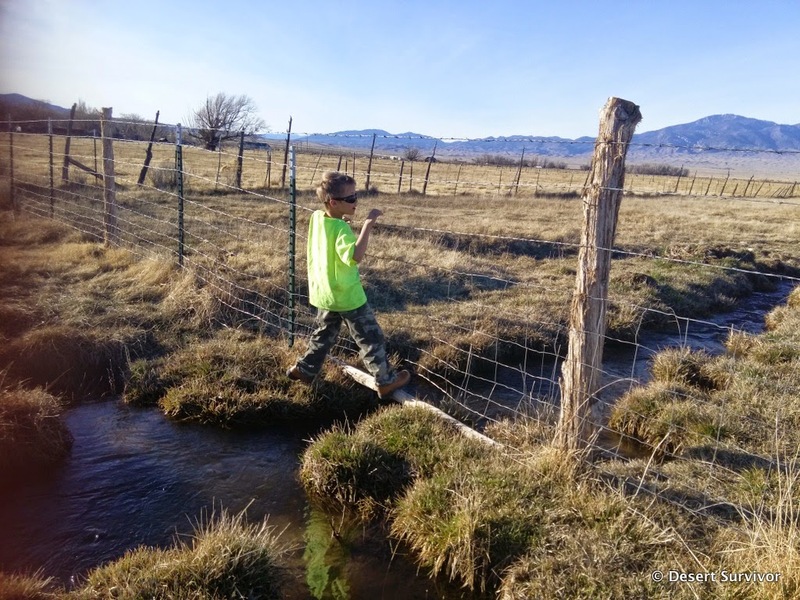 That started with crossing an irrigation ditch. A little challenge soon had them concentrating and happy. Of course if Big Brother did, Desert Girl had to do it too! Henry stood by watching. Henry had a little adventure of his own. 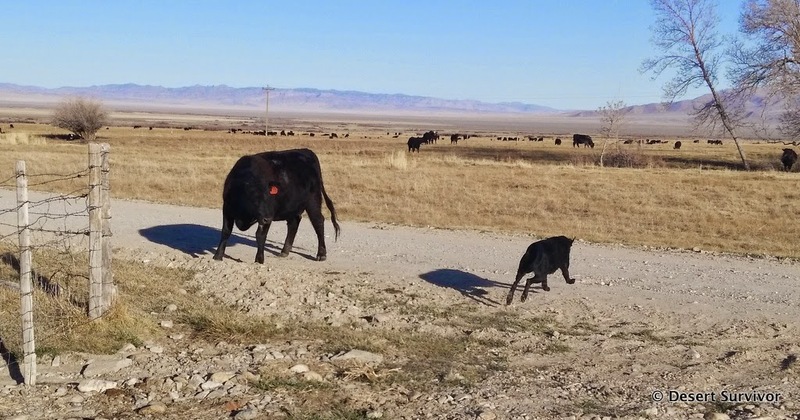 He likes to chase cows, but they also like to chase him. It's always interesting to see which one is going to move first. I think the cow won this time. 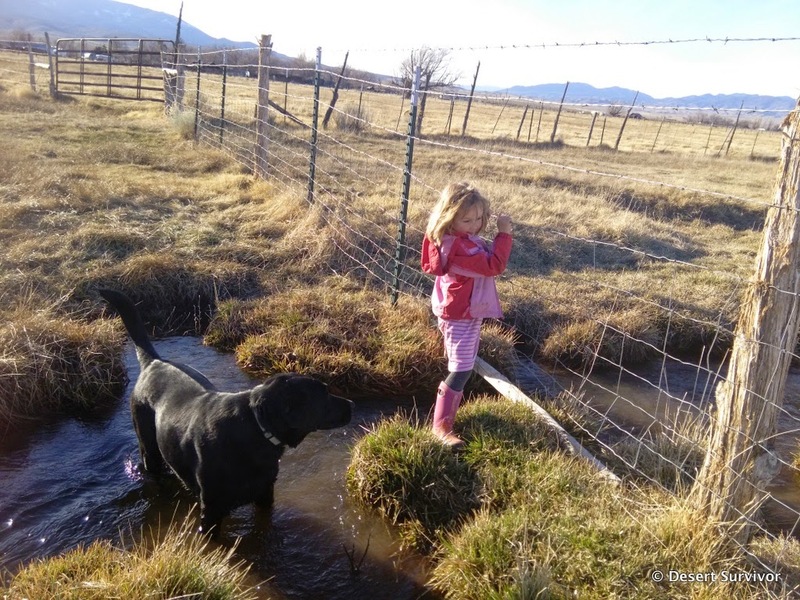 We followed the creek for a long time, and the kids loved these little "islands." 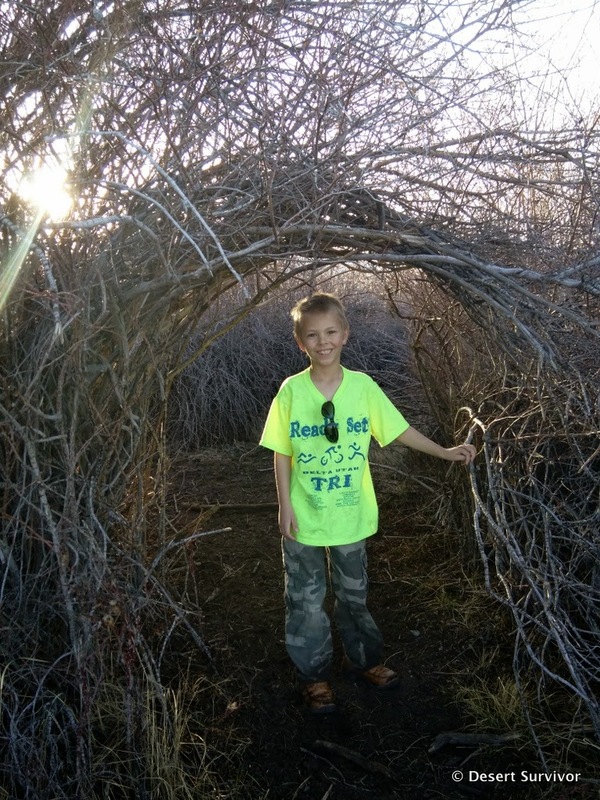 Then we found tunnels through the willows. They were a lot of fun, and the kids were the right height to go through them easily! 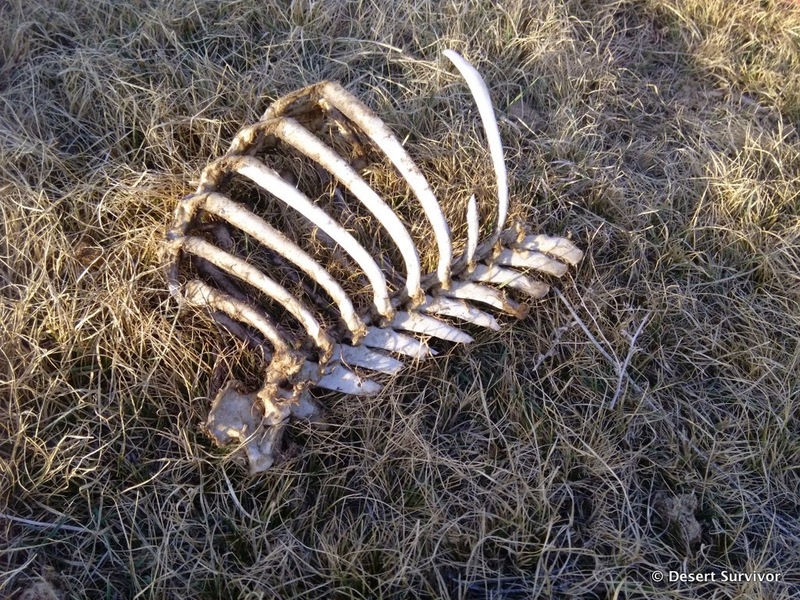 Later we found some bones. Big excitement. 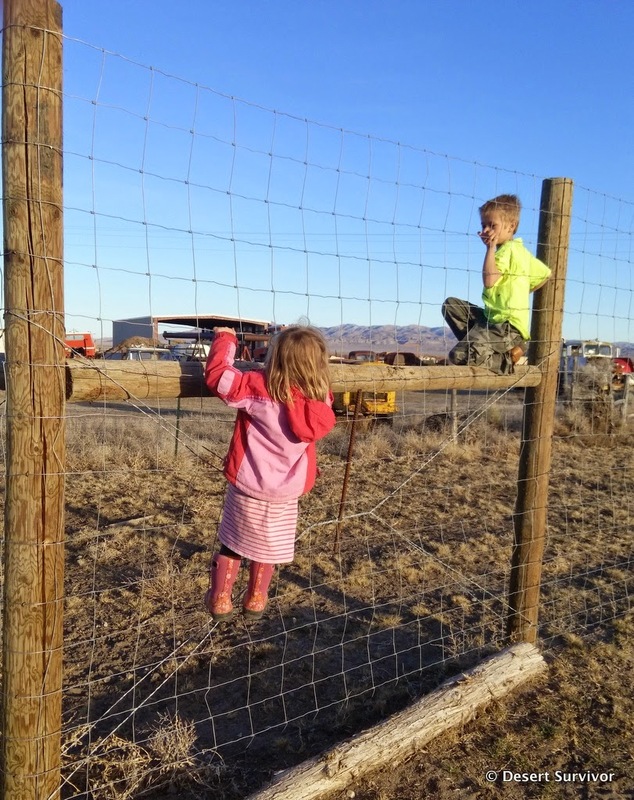 Before long, we had another obstacle: a ten-foot high fence put up to keep the deer out of the hay. Desert Boy easily scaled it, but Desert Girl came through the gate with me. 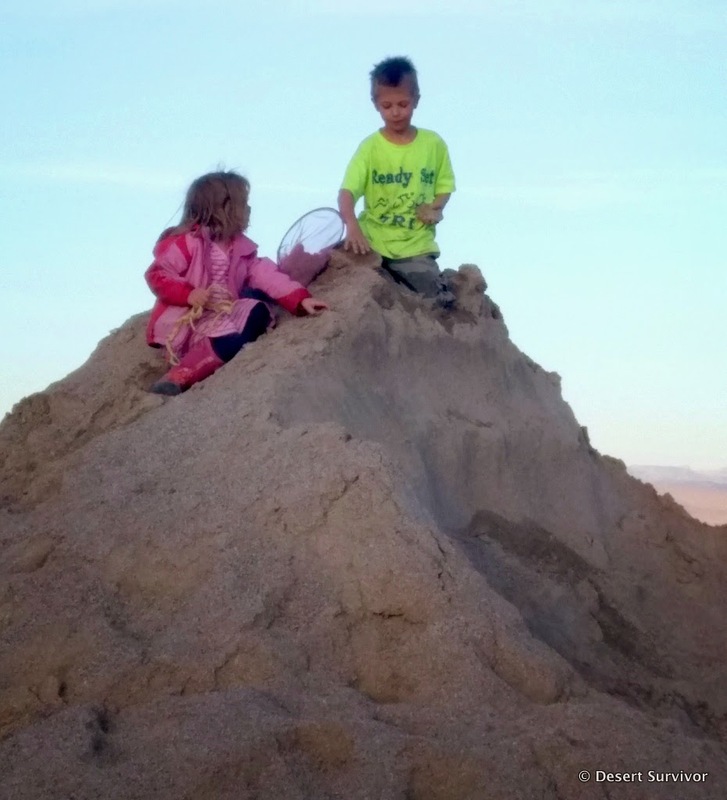 Before long we ended up at the sand pile near the shop (the sand is for making concrete). When it was time to go, the kids didn't want to leave. Hurray for excuses to spend more time outside. The kids often grumble when I tear them away from their electronics, but they end up being happier outside. 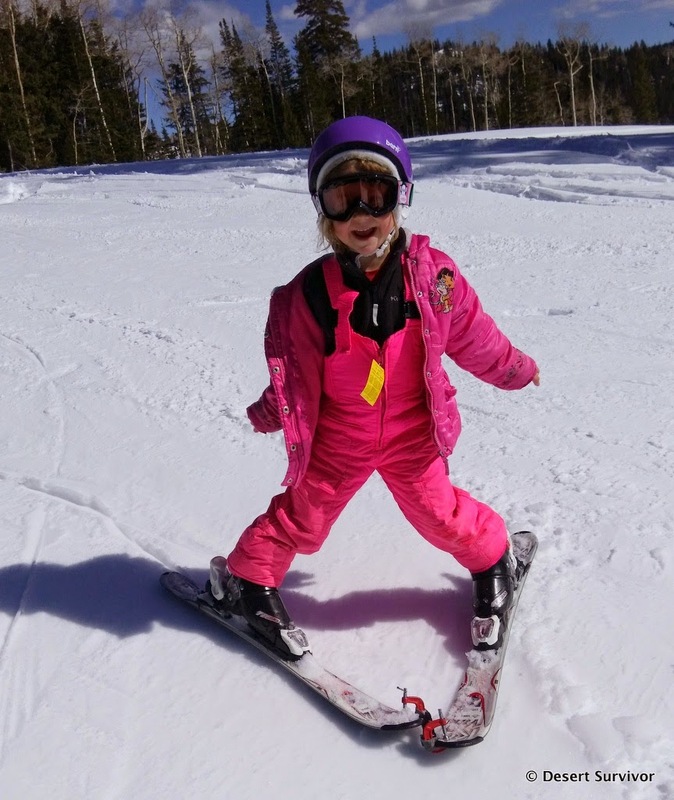 Desert Girl is five now, and she's been waiting for her big opportunity to go to ski school. We were hoping she could go with her friend Isaac, but it didn't work out (hopefully next year!). I wasn't sure if she would freak out or buck up and make it work anyway. Fortunately, she chose the latter and had a super time. 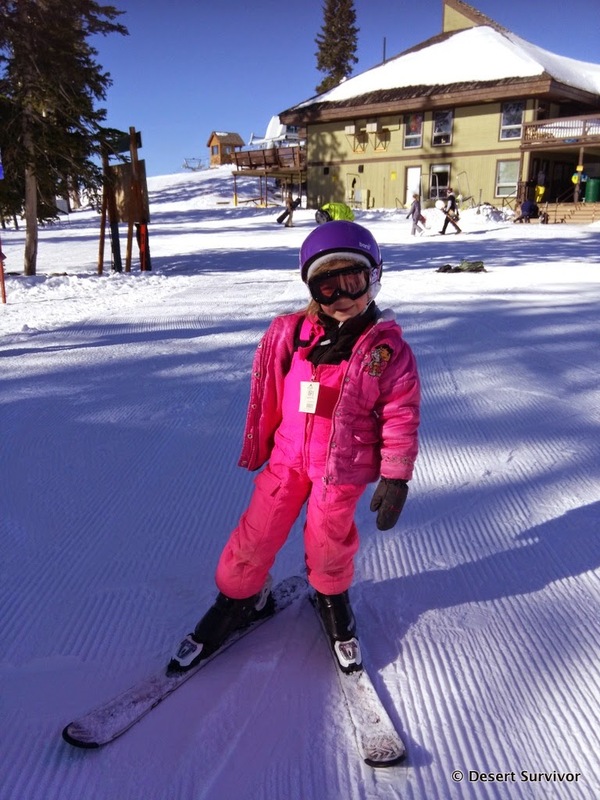 Dressed to the nines in her pink ensemble, she joined her small ski class and learned how to take off and put on her skis. We set the stage by staying in Beaver, Utah the night before we went to Eagle Point. The Comfort Inn has an indoor pool that was warm and really popular. The kids loved it so much. 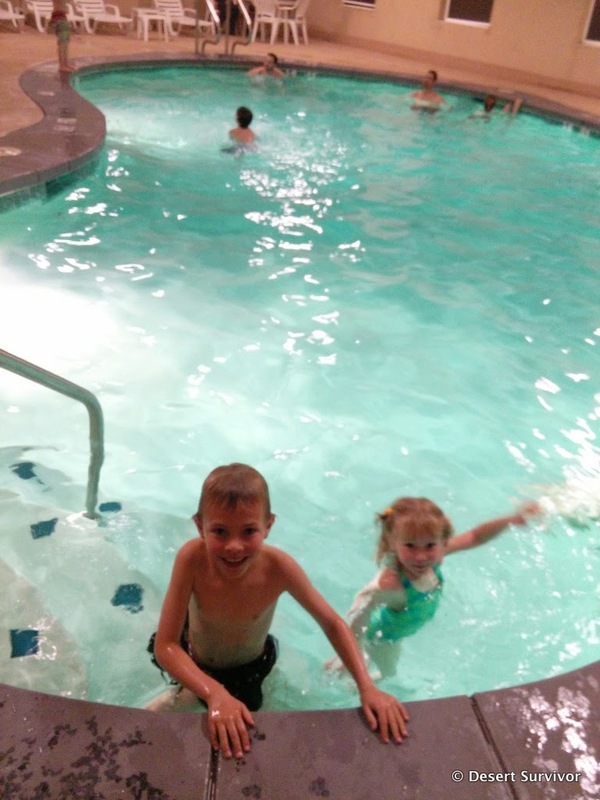 They both got mini-swim lessons and improved considerably. Desert Girl even managed to float on her back for 20 seconds. Being close by was especially nice since we had the time change to deal with. We could wake up about our normal time and hit the slopes right at the beginning. 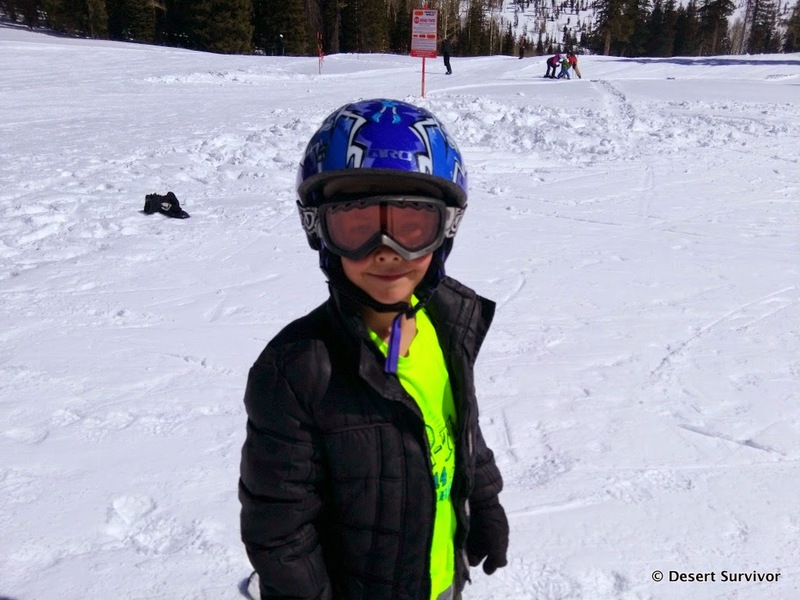 Desert Boy went for a morning ski lesson to improve his style and started learning how to do turns with parallel skis. He's got aways to go, but is doing well. One of the reasons we went that Sunday was that they had free lift tickets. 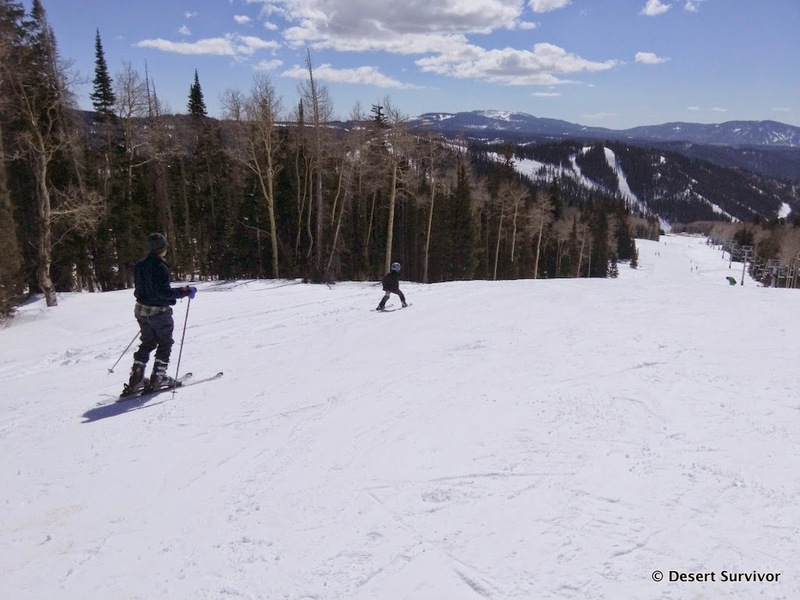 Eagle Point was quite busy, but busy for them still means lots of wide open slopes. We met up with over a dozen people from our remote valley who were there for the day. By the time we picked up Desert Girl in the afternoon, she was ready to take us down the slopes. She used "pizza" most of the time. It was a beautiful day, and we're glad we went. 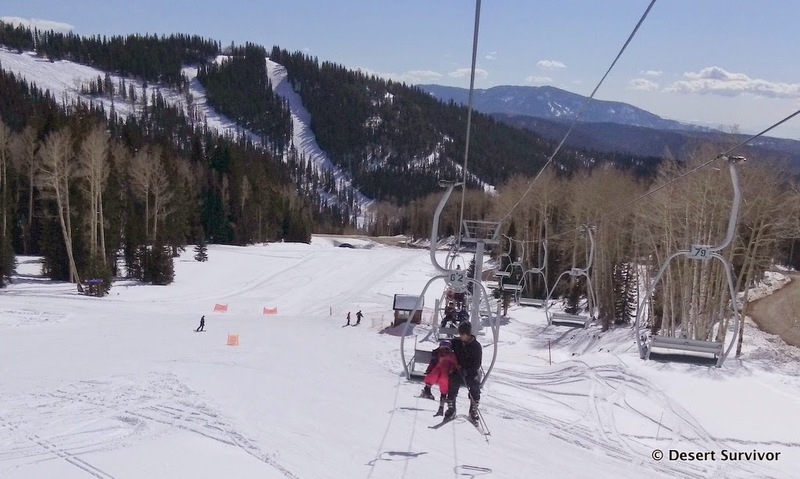 Eagle Point has already closed for the season because it's been so warm. Hopefully next winter we will get more snow and skiing opportunities! Last October, my friend Matt let me know that the Department of Energy had opened up its 2015 dates. My husband and I filled out a form and applied for the February trip. We had to get a background check, and about a month after we applied we received word we were approved to go on the trip. About a month before the trip we received a packet in the mail. It contained a page of prohibited items (cell phones, cameras, binoculars, recording devices, incendiary devices, etc.). If any of those items were found on anyone during the trip, the paper warned, the trip could be cancelled. We also had a minute-by-minute itinerary for the daylong tour. The day before the tour, we went to the Atomic Testing Museum, which somehow managed to make a very interesting topic seem, well, kind of boring. The museum, part of the Smithsonian, was quite a letdown, and not something I'd recommend unless you are really interested in the topic and can go through the museum during a quiet period, when you don't have four or five different videos all running at the same time in a small space. Fortunately, the tour was fantastic. The plan was to meet at the museum at 7:30, have our identification checked, receive a badge, and then board a bus and depart at 8 am for the Test Site. 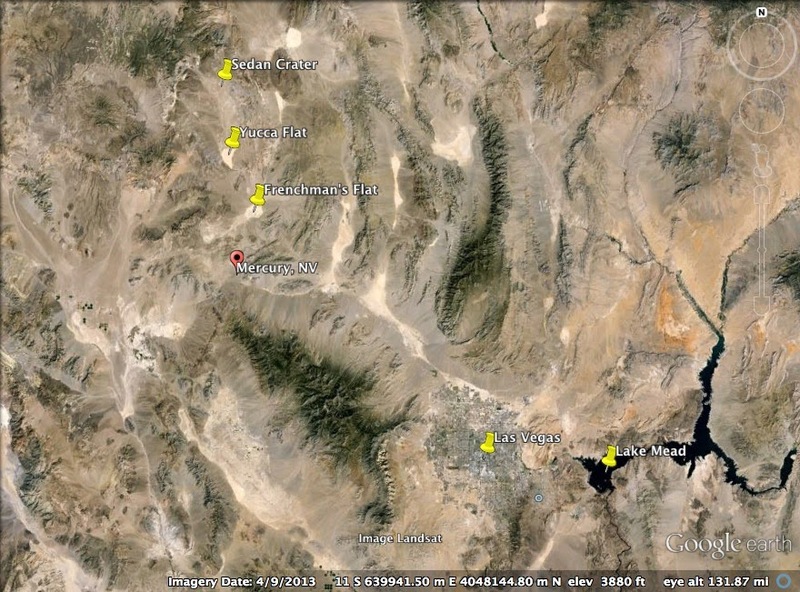 Our tour would include visits to Mercury, Frenchman's Flat, Yucca Flat, Sedan Crater, and more. Our guide was Ernie Williams, an 84-year old veteran who had worked at the Nevada Test Site beginning in the 1950s. After he retired, a contractor who does work at the NTS hired him and he continues to work part-time. Because he had been there during the tests, he had great stories to tell. And a wonderful memory. After going through the guard station (run by contract guards), we stopped at the cafeteria in Mercury, NV. At one time this was a huge town, complete with an Olympic-sized swimming pool and a bowling alley. Nowadays the Test Site employs many fewer people, and most commute every day. The cafeteria had bathrooms and vending machines. Then it was onto Frenchman's Flat. Ernie had us get out of the bus to look at some elevated tracks that had been part of one test. The pressure wave had bent them. We then drove around some of the other buildings that had been tested to see how they would withstand the impact of a nuclear bomb. What surprised me most during the day was just how many tests had been done at the Nevada Test Site: 100 atmospheric tests and 828 underground tests. These were done between 1951 and 1992. This fact sheet gives a great overview of the history of the NTS. 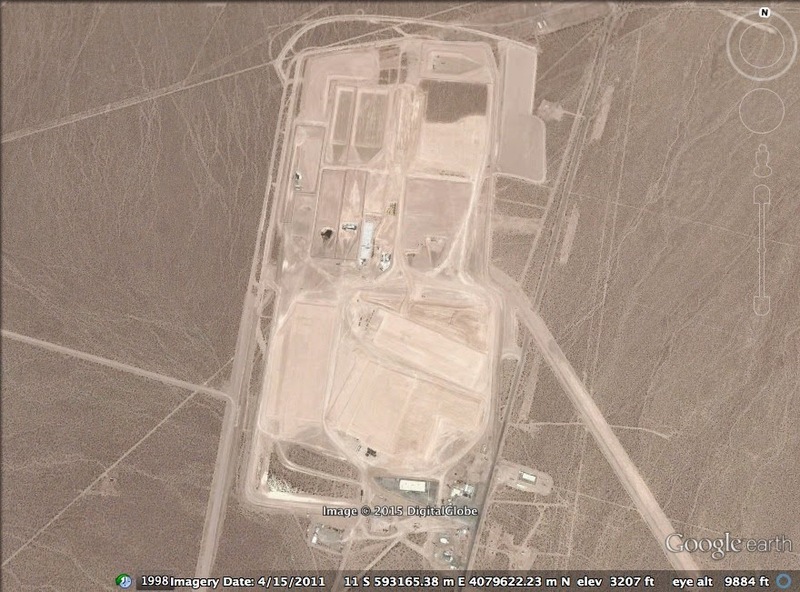 Some of those tests left nuclear waste behind, and part of the Nevada Test Site is a low-level radioactive disposal area, where they dig pits, put in the garbage (some of it from other Department of Energy sites), and then bury it. We visited the site and saw some of the places where they bury the garbage. "The DAF is a collection of more than 30 individual steel-reinforced concrete buildings connected by a rectangular common corridor. The entire complex, covered by compacted earth, spans an area of 100,000 square feet. Currently the United States is not conducting nuclear tests. However, the President pledged to maintain an underground test readiness program in the event that nuclear testing resumes. The DAF plays a crucial role in achieving test readiness capability." We went over the pass and descended into Yucca Flat. Soon we were driving with big craters on either side of the bus. We even drove down into one, Bilby Crater, and back out again. 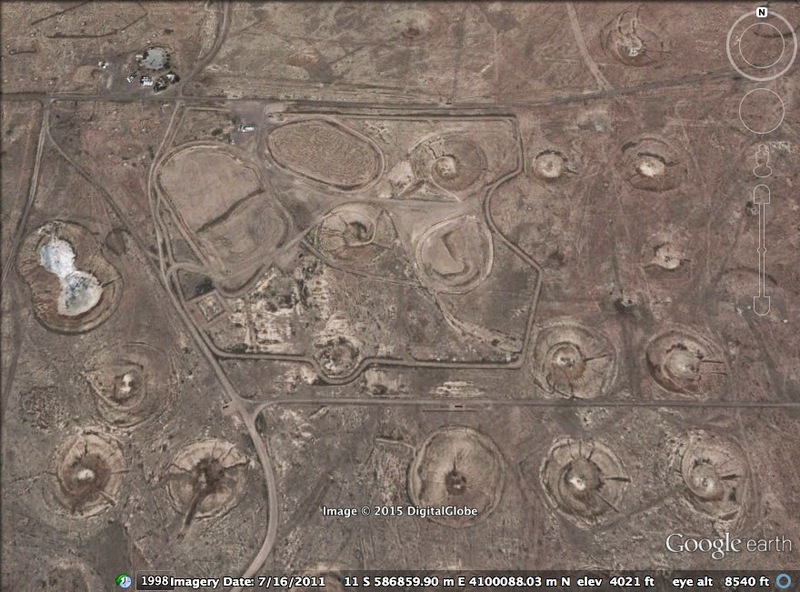 The craters formed when the nuclear explosions basically melted the rock. Different sized craters reflected the different sizes of the weapons and the different depths at which they were deployed. We got out of the bus at a huge white building, about six stories tall. This was the site where they were going to do the 829th underground test. They had the hole drilled, the equipment in place, the trailers with the sensing equipment ready, and then George Bush declared a moratorium on nuclear testing. Ernie was not at all happy about that. He said $66 million had been put into this test. I asked if that was the average cost for each test, and he said no, the average was $25-$30 million per nuclear test. Wow again. They had all sorts of reasons for doing tests. One was to see how much earth could be moved, say in case they wanted to make another Panama Canal using nuclear bombs. (Never mind the ramifications of highly radioactive ground potentially being flooded.) The result was Sedan Crater, the biggest crater. We had a nice stop at it. 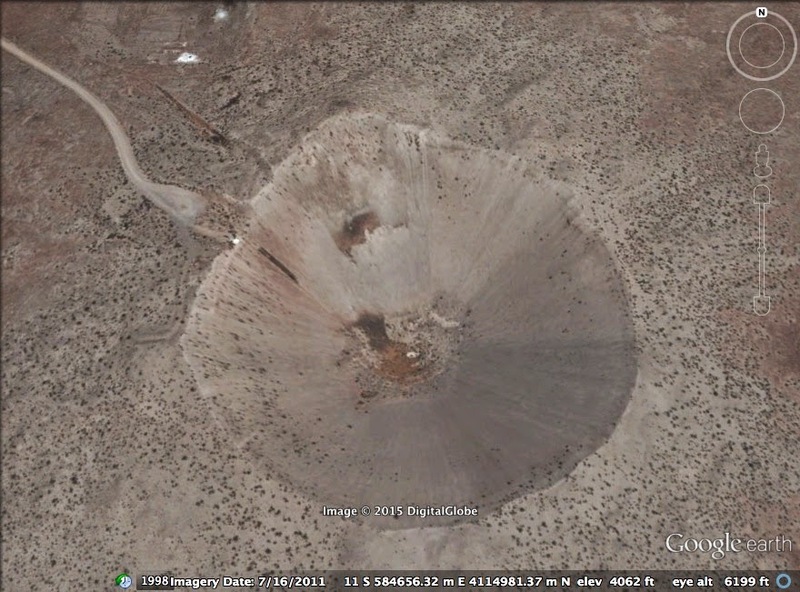 It reminded me of Ubehebe Crater in Death Valley or Lunar Crater along Highway 6 in Nevada. Except this one was manmade. Ernie took a group photo of us (no horizon allowed in the photo--it said so on our itinerary, which we were now way behind, but that was okay with all of us because it was so interesting. We also had to make sure we put our temporary badges away. That was very important for some reason.). 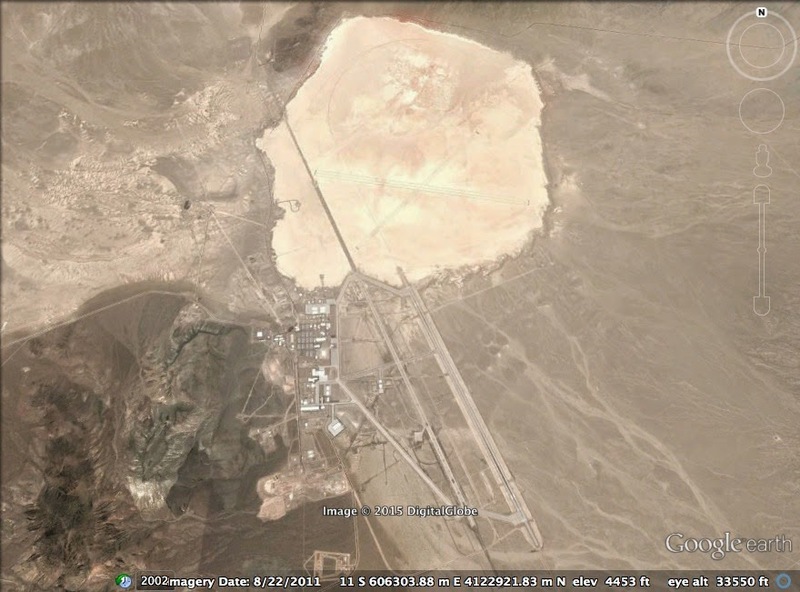 Not far from Sedan Crater is Groom Lake, home to Area 51 (and perhaps the reason no horizon was allowed in the photo above?). Ernie helped develop that, but he couldn't tell us much about it. 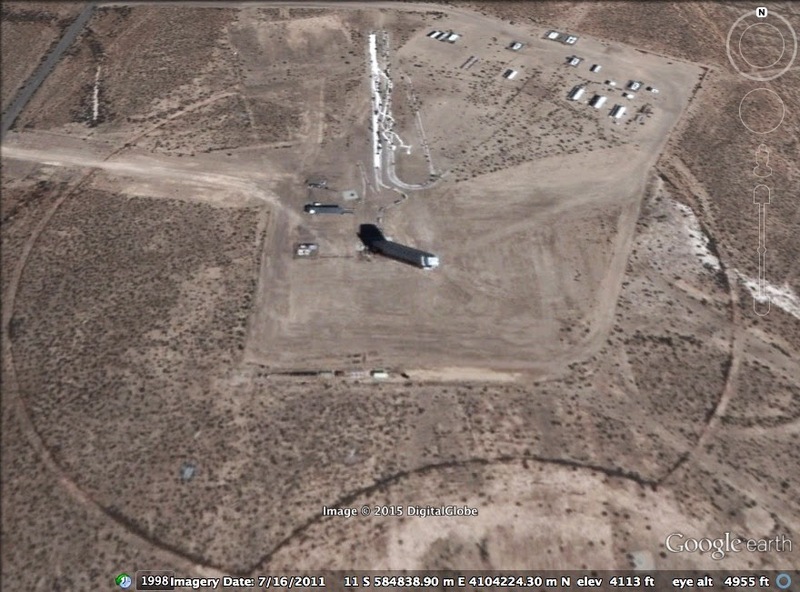 The Google Earth image of it reveals a huge installation, and I wouldn't be surprised if much of it is underground so pesky satellites can't see what's going on. 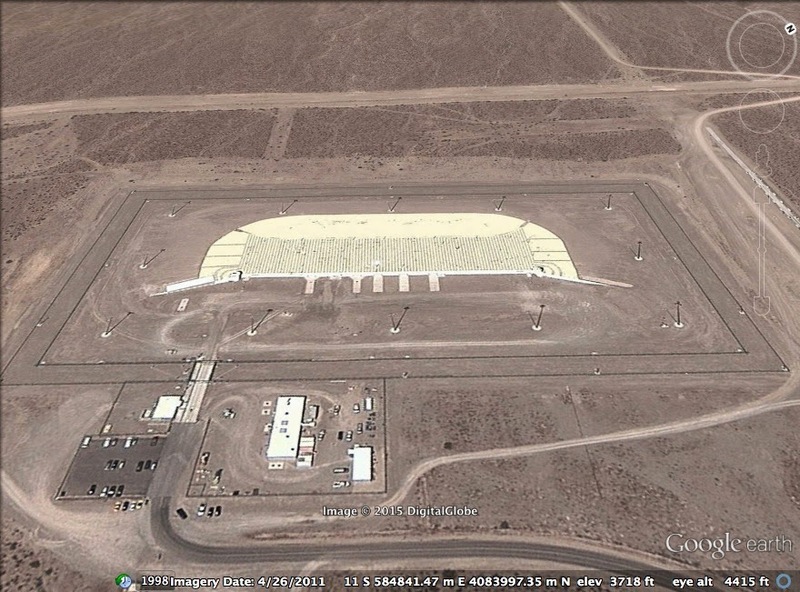 You can see in the Google Earth image below runways and hangars--lots and lots of hangars. After visiting Sedan Crater, we took a different road and passed by some trenches where troops had witnessed nuclear explosions and had been part of an experiment to see what would happen to them. There were also experiments to see what would happen to animals, houses, and equipment. We made a stop at the Mercury cafeteria on the way out, then drove the hour back to Las Vegas. To learn more, you can find many fact sheets here. And here's a specific one just about the tour. Finally, thanks so much to all those who helped watch and shuttle our kids so that we could go: my mother-in-law Sylvia and her husband David; our babysitter, Carmela; and the great carpool friends, Jenny, Jess, and Stephanie. We were recently gifted some new pets by my brother and sister-in-law. Have you ever had these pets? They are sea monkeys! Otherwise known as brine shrimp. Sea monkeys have been marketed since 1961, when they were called Instant Life. The next year, their promoter, Harold Von Braunhut, invented the term sea monkeys because their long tail somehow looked like a monkey tail. Sea monkeys were marketed extensively in comic books. We received a little tank that we filled with water and then added a packet of water conditioner (basically salt). The next day we added sea monkey eggs. The brine shrimp have a life cycle that includes cryptobiosis or anhydrobiosis, which is basically an inert state that allows them to withstand drying up, like they might encounter out in real life when a puddle dries up. That's the reason they can be shipped around the country (and even to the moon!) and then hatch when they're put in water. According to Wikipedia (which has more interesting information), the sea monkeys we have are not found out in nature. They're a hybridized version called Artemia NYOS (New York Ocean Science). As far as pets go, they're easy to care for. We add water and food about once a week. We go look at them occasionally. And I had some fun doing a photoshoot (they move fast, so it's hard to capture them!). And they're much smaller than they look in these photos--about a half-inch long full grown. Thanks to my brother and sister-in-law for enriching our lives. We will be sure to reciprocate. Although we might send a pet that's a little larger, like our other pet, who happens to wag his tail quite a lot. The Sandhill Cranes are Back! Sandhill cranes recently returned to the ranch, to my great delight. These huge birds are so fascinating, and they really leave no doubt that birds are descendants of dinosaurs. Sandhill cranes have been around for quite awhile (although not as long as dinosaurs); their fossils have been dated back as far as 2.5 million years. The photo above shows the reddish feathers on these sandhill cranes. Those are due to foraging in iron-rich mud. Also note the curved feathers on the rump. I got out of the van to take the photo, and that spooked the birds, so they took off. This photo isn't quite in focus, but the shape of the bird makes it look so much like a pterodactyl that I had to include it! The sandhill cranes made a big circle and flew in the beautiful golden hour sunlight. As I was editing the photos I saw that the birds flew in sync. But then they didn't. Why not? Well, probably due to a small weight difference, although both sexes are nearly the same size. Sandhill cranes mate for life, which is sometimes more than 20 years. During the summer, sometimes up to 30 sandhill cranes stay at the ranch. I haven't seen baby sandhill cranes, but my husband has. Typically they raise just one young a year. Back in sync again, with the shadowed foothills in the distance. For more about sandhill cranes, along with a recording of their cool sound, check out this Cornell Lab of Ornithology link. Lehman Cave at Great Basin National Park was the place to be for a lint and restoration camp in February and March. I took the kids to participate for a day. Desert Girl helped pick up pieces of litter with some tweezers. The tweezers made it a fun task. A lot of people came for the February lint camp. We quickly became friends. My friend Deanna came from Ely with her daughter, which made Desert Girl very happy. But even with friends, the kids eventually tired of cleaning. They took a movie break. The cave proved to be an excellent theater. 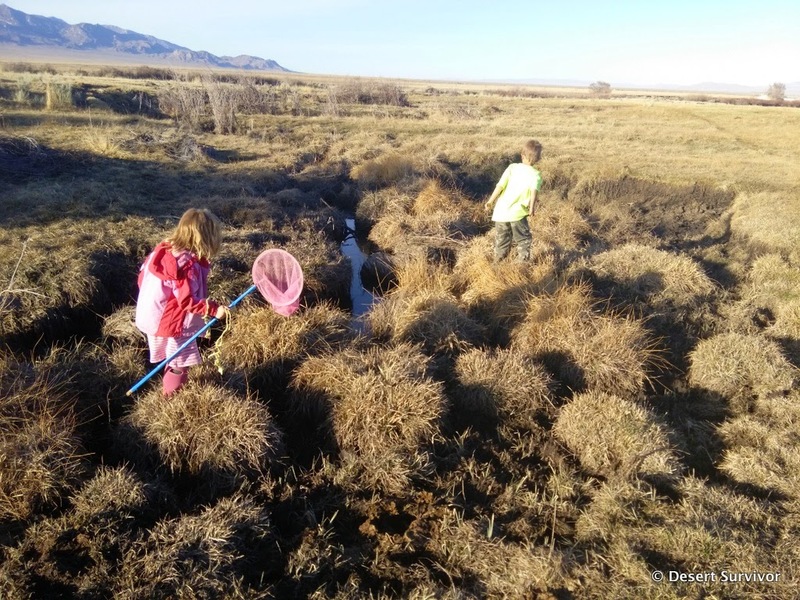 Meanwhile, the volunteers were busy dusting stalactites and stalagmites, picking hairballs out of popcorn, and removing old trail debris to uncover natural cave floors. The back of the pickup truck started filling up. So why would people volunteer their time to clean the cave? One reason is they get to visit parts of the cave that are usually off-limits, like the Talus Room. Here the special tour traverses the Sunken Garden, bypassing the pools of water. We even found a pseudoscorpion, which is rare in this part of the cave. Before long we were in the immense Talus Room. It is so different from the rest of Lehman Cave, cavernous and almost barren, with very few formations. Huge boulders litter the floor, giving testimony that this isn't one of the most stable parts of the cave. Some beautiful formations do decorate the ends of the room and also this huge wall, called the Rainbow Wall. On another slab, the cave has been turned into a bulletin board with signatures from 1885. Everyone enjoyed seeing the Talus Room. Then it was back to work. Here are some rimstone dams that I was cleaning. Dirt had obscured many of the crenulations. Another part of lint camp involved checking all the lights for algae growth, and upon finding some, spraying it with a bleach solution. The algae is not natural to the cave environment and also provides an unnatural food source. Lint camp has an interesting effect on people. Many come and are surprised by how much they like it. They find a zen in concentrating on just one area and making it look better. They start feeling like that little part of the cave is theirs. They can't wait to come back and make it look even better. They even say that they don't want anyone else to touch their spot--it's theirs and they have dreams about it. So who knew? Lint camp is so much more than cleaning. It's about finding peace, making new friends, discovering parts of the cave that haven't seen the light for decades, and feeling that you're making a difference. Thanks to everyone who participated in lint camp! If you'd like to read a couple other perspectives, check out these articles and photos in the Los Angeles Times and National Parks Magazine.